The Software Value of the Super Nintendo Classic System Is an Insane $572.00 — GamingWithSwag.com - Dads By Day, Gamers By Night. That's incredible. 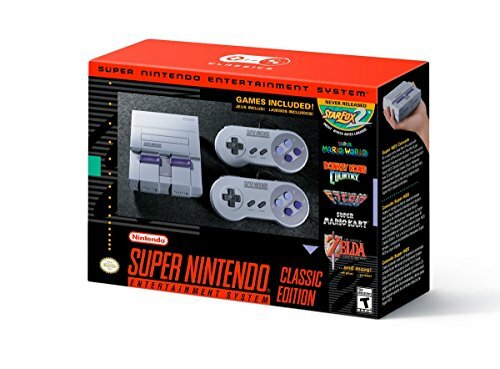 Considering that the Super Nintendo Classic system will cost around $80 and comes with two controllers, the value of the actual games installed makes even a scalper's price look good. The Nintendo Classic System had a similar value with high dollar games installed like Kirby's Adventure and Final Fantasy. But it does not come anywhere near the value of the Super Nintendo Classic. Nintendo has claimed that more systems will be available this time around which will please consumers. And since the system comes with two controllers, there is no need to worry about a recreation of the Great NES Classic Controller Shortage of 2016©. The value of Star Fox 2 is really priceless, due to it never being officially released. Then there is the value of the hardware itself. An original Super Nintendo system usually costs about $59.99 here in my area on the east coast. This comes with only one controller, and may or may not have the original accessories with it. And of course, game cartridges are sold separately. What would be really cool is if the Super Nintendo Classic system had the ease of modding that the NES Classic had. Having such a painless procedure to get all of your favorite titles on a single interface is brilliant and ultra portable. Still, despite Nintendo's promises to keep these in stock, you still want to obtain a preorder to successfully obtain your system. Oh and if you were wondering what the MUST HAVE item is this upcoming holiday season? Forget Hatchimals, it's all about the Super NES Classic during Holiday 2017. This combined with the Nintendo Switch system, Super Mario Odyssey, and other new releases, Nintendo is going to be seeing an incredible Q4 sales figures based on this lineup. It's good to be a Nintendo fan in 2017.